You don't have to own a tandoori oven to make this delicious, piquant chicken at home. Just crank up the heat to achieve some beautiful charring. Cool it all down with a tangy radish raita with toasted mustard seeds for a full-on taste bud dance party. Have every other spice except garam masala? Make your own garam masala blend by mixing together equal parts ground cumin, coriander, black pepper, half parts of cardamom and cinnamon, and a pinch of nutmeg. Per Serving: 675 calories; 39g fat; 18.7g carbohydrates; 69g protein; 340mg cholesterol; 1282mg sodium. 4 stars because this recipe took so much effort. really tasty, but took forever. This seems like a ton of ingredients, but I pretty much had all of these on hand and glad to be able to use them finally. There are local grocers that have most of the spices combined into one package so you don't need to get a whole jar of each spice. I ended up using chicken tenders and opted for a plain yogurt instead of Greek yogurt. It's less tart than Greek yogurt and can take somewhat of a backseat to all of the other flavors happening in this dish. Really happy with how this turned out! The flavors just hugged me all over. 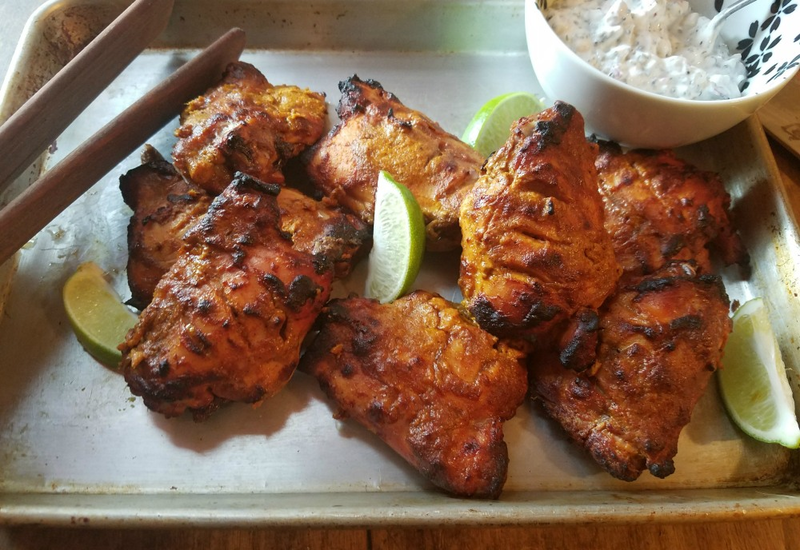 This is one of the best homemade tandoori chicken recipes I've ever tried! The flavors were very authentic and the chicken turned out juicy and moist. I marinated the meat in the morning and cooked it in the evening, which was plenty of time. It came out just like the tandoor chicken at my favorite Indian restaurant! This tandoori chicken was so flavorful, all of the spices make this dish great. The yogurt coating on the chicken helps keep all the flavors inside and the meat tender and juicy. I am definitely going to make this again. Amazing dish! The spice balance was perfect, texture and flavor were on point. I especially loved the Raita. I didn't change a thing.